I always want to make sure my skin looks really good, especially when I have to work a busy week, travel for shoots, make a few appearances, attend events, and networking dinners. There are so many products that are a waste of time and money, so when I get my hands on a good one I think of it as an investment on my skin health. I personally love a good face mask and use them weekly, adapting them to my skin’s needs. I’m always on the hunt for a face mask to soothe dry skin and pull out impurities while shrinking your pores and getting some anti-aging punch. After being on the hunt for far too long for a good mask, I decided why not create my own face mask? So here I am, announcing the launch of my brand new face mask with you! Many consumers think going “all natural” with products is the best way. Unfortunately, I must say that a lot of “natural” ingredients, such as “Rose” or “Lavender” are plant extracts, that can severely aggravate your skin. Lemon is another mistaken ingredient that is not good for your skin. It’s a citrus fruit that is a skin sensitizer. People are mistaking many ingredients in their products. So firstly, I want to share the Key Ingredients, as listed on the packaging of my new product. It’s very important to understand ingredients when searching for proper skin care. We all have our favorite beauty rituals, & with mine I like products that are quick, easy and effective. This mask is effective after only 10-20 minutes of use. Therefore, if you have 10 minutes to spare, I suggest managing some time to steal focus on yourself and indulging in this mask. If you want to infuse your skin with vitamins, antioxidants and other goodies from the outside in, you must try this luxe face mask. 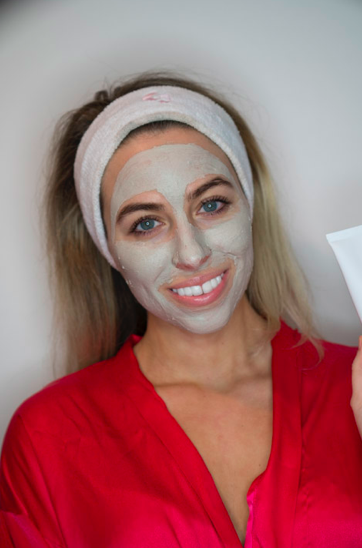 This mask is specifically formulated to clean, pull toxins out, shrink pores, lift dead skin cells, draw out impurities, rehydrate, while anti-aging properties help firm and even out skin tone. Apply a good thick layer with a brush or fingers to cleansed face. I use CeraVe Hydrating cleanser. After 10-20 minutes, throughly rinse away residue with lukewarm water. Follow up with a good moisturizer. My current favorite moisturizer is CeraVe PM facial moisturizer lotion. Don’t over use products. I only use this mask for 10-20 minutes 1x a week at night. Your complexion will appear astonishingly retextured, cleansed and glowy. **** Avoid contact with eyes and avoid using products that aren’t right for your skin type.